The Honor 8 Pro comes in a simple-looking box, which contains the charger and the USB Type-C cable. The phone supports quick charging and Huawei provides an appropriate 18W adapter, but you shouldn't mistake this regular-sized one for the chunky Super Charger bundled with the P10 series. The small paper compartment, which holds the SIM ejection pin, also houses two lenses. 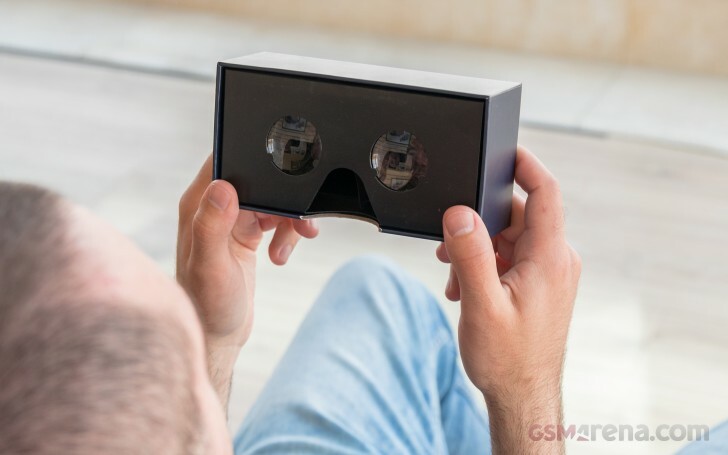 The box houses a cardboard-style VR headset - you have to take everything out to get to it. The whole VR set is quite easy to assemble, but there are directions if you are struggling with the DIY stuff. We'll get back to the VR capabilities later on in the review. 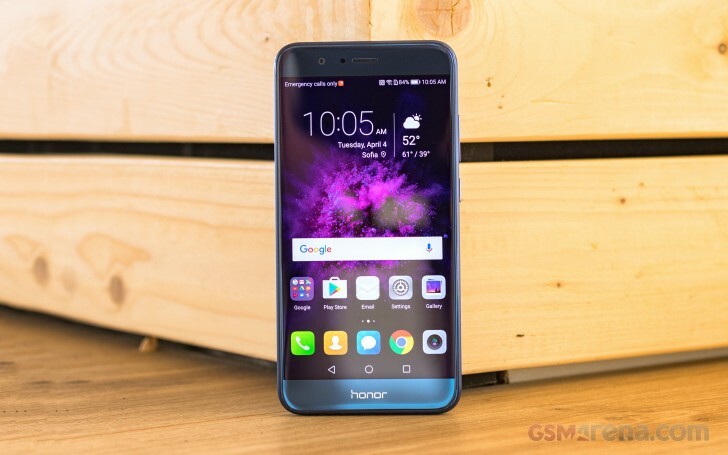 The Honor 8 Pro measures 157 x 77.5 x 7mm, which is about right for a 5.7" smartphone, though Huawei could have tried reducing those top and bottom bezels. The phone is 3mm wider and taller than the 5.5" P10 Plus and weighs 184g, 19g up from the P10 Plus. We tried to find a relation between the Honor 8 Pro and some previous models by Huawei, but it turned out a near impossible task. Instead, we can see the phone has borrowed small design cues from a number of other devices, most of which are not even Huawei-made. But that's fine, as the final result is quite attractive and the phone is very solidly built, too. 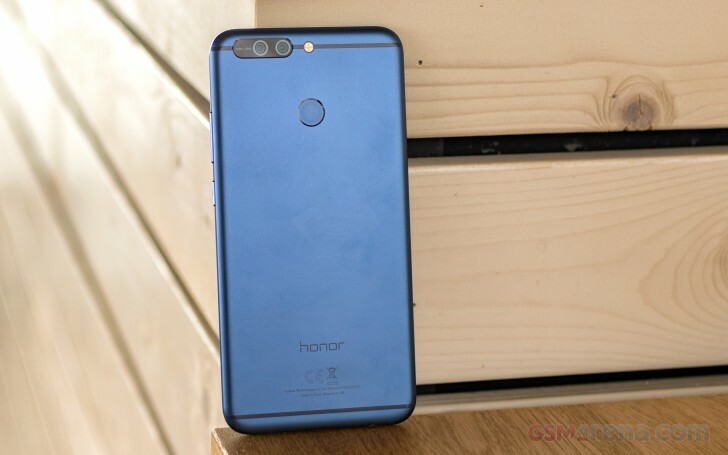 We have the Navy Blue version of the Honor 8 Pro - it is a somewhat darker and stronger shade of the signature Dazzling Blue option for the Huawei P10. The paint keeps a solid, uniform color across the all-metal back, the side hardware keys, the fingerprint scanner, all the way to the screen bezels under the front Gorilla Glass. Huawei decided to use the antenna lines as decoration instead of masking them within the frame. Painted in deeper, darker blue they serve as nice design accents. The top one emphasizes the dual-camera setup, a premium feature even without the Leica branding. Unlike some cheaper midrange devices, the Honor 8 Pro has the seamless design of a single piece of metal, even though the antenna strips might suggest otherwise. The chassis of the Honor excels in both sturdiness and looks. The Honor 8 Pro feels thinner than the P10 although both share the same impressive 7mm thickness. Its unibody is in fact slimmer and sharper, because the screen is attached on top of the body, while the P10 has its display embedded and flush with the frame. The frame's sharper top chamfer and bottom edge make for an excellent grip. Immune to fingerprints, the matte finish also improves the overall experience and aesthetics. The Honor is big, sure, but it's one of the best-handling phablets we have used lately. The Honor 8 Pro's layout of controls is by the book. Above the screen is the earpiece, the integrated status LED radiates underneath its grille. The 8MP selfie cam is around, as are a couple of sensors. The bottom bezel features no controls, the 5.7" screen, the phone relies on on-screen Android navigation keys. The left side has the familiar hybrid SIM slot, which can take two nano-SIMs or have one replaced with a microSD card. The Honor 8 Pro comes with 64GB of inbuilt storage, so you may never need a memory expansion card. The volume rocker and the textured power/lock key are on the right. The Infrared blaster and the secondary mic are on the top. The busy bottom houses the USB Type-C port, the primary mic, the audio jack, and the loudspeaker grille. The back of the Honor 8 Pro is amazingly simple - the dual-camera sits flush with the surface, there is a small dual-tone flash, and the fingerprint scanner is subtle enough to not botch the simple brushed metal finish at the rear.